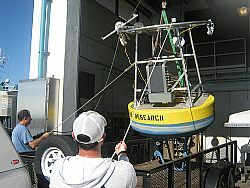 A new buoy deployed this month by the Florida Fish and Wildlife Conservation Commission (FWC) in Old Tampa Bay collects continuous water quality information to help researchers learn more about conditions that trigger harmful algal blooms. "This buoy fills an important gap in Tampa Bay monitoring efforts," said Alina Corcoran, who heads harmful algal bloom research at the FWC. "It collects data autonomously, allowing us to gather data without having to go out into the field, and we can communicate to the buoy remotely." The buoy, which transmits data every five minutes, complements existing long-term monitoring efforts in Pinellas and Hillsborough counties by capturing short-term changes in water quality. The buoy features a next-generation system that continuously transmits underwater information such as water temperature, salinity, clarity and dissolved oxygen. It also monitors chlorophyll fluorescence, which is a bloom indicator. Above the surface, the buoy has a weather station that collects information such as rainfall and wind speed and direction. This type of monitoring is critical to help scientists understand the factors that lead to harmful algal blooms in the system. The harmful algal species Pyrodinium bahamense has bloomed annually in Old Tampa Bay in recent years, yet the drivers of blooms are still not entirely understood. "By using high-resolution data, we will be able to directly link environmental factors like changes in salinity due to rainfall to changes in Pyrodinium bahamense abundance," said Corcoran. The data collected will also help managers assess the success of restoration projects and refine water quality standards. Real-time data will be available online at www.gcoos.org and www.secoora.org. For more information about the FWC’s harmful algal bloom program, visit MyFWC.com/RedTide.